Grace helped us buy our perfect home. She was very patient and understood our needs. Her practical experience in the Fairbanks real estate market and knowledge of the community proved invaluable in our purchase process. After we selected our home, she helped guide us through the mortgage, insurance and closing processes. Not only did she save us from potential pitfalls, we ended up saving a great deal of money. We would recommend Grace to anybody looking to buy a home in Fairbanks. Thanks Grace! I've been more than delighted with Grace Minder's professionalism and ability to close a house sale. During a four-month period in 2008 she was able to sell two homes for me - my own house and my parent's home - in a market that was less than ideal. Grace gave me plenty of useful ideas for preparing our real estate for sale. Also, when I needed help with repairs and upgrading, Grace had contractor and handyman contacts who arrived promptly and worked quickly, producing fine finished results. I highly recommend Grace Minder as a realtor in the Fairbanks area. She works hard, fast, and sells the house! Grace Minder just helped us purchase our first home in North Pole. We love it! The home is perfect for our family. Our situation was unique because we had to find and buy a house while we were still living in Honolulu. We were unable to see it in person. Grace Minder provided invaluable assistance in all aspects of our successful home purchase. We relied on her in-depth knowledge of the area and her assistance in negotiating all aspects of the process. She confidently selected all of the best people to use in appraising and inspecting our future home. She knew how to answer our questions and resolve our anxieties. My wife and I always felt that we were being assisted by the most skilled professional. 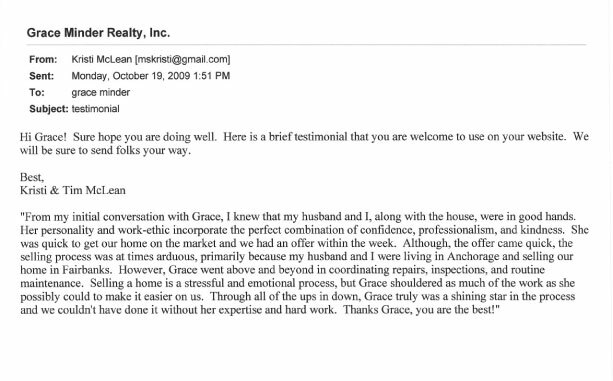 But, more importantly, Grace's responsiveness, candor, and personal touch assured us that we could trust her. This was critical in our particular situation. Most of our friends and family thought that we must be insane for going ahead with a purchase, sight unseen. But we could not be happier with the home. 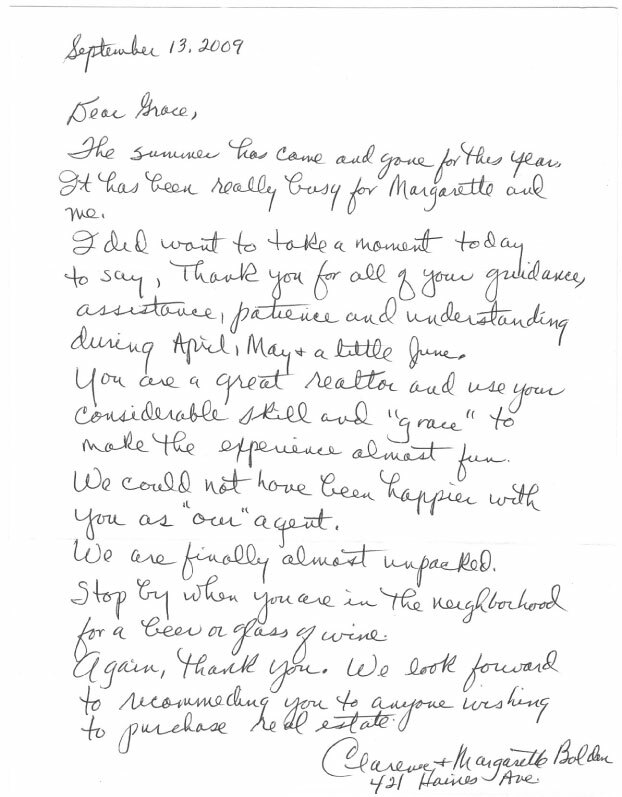 And we could not have been happier with the full range of assistance that we received from Grace Minder. Working with Grace was a wonderful experience. She took the worry and stress off my shoulders when I bought and sold my home. She hit the mark, matching me with a place that fit my criteria when I was buying. During the whole process, she was available and quickly responded to my concerns and inquiries. She soothed my anxieties with patience and professionalism. Working with Grace felt like working with an old friend, someone you can trust and know is looking out for you. When I decided to sell, she promptly came by and let me know what I should and shouldn't do prior to putting my place on the market. She was fast to research the market and advise me how best to proceed. It was great to work with Grace because of her cheerful disposition, enthusiasm and knowledge of Fairbanks. Grace is truly someone who works for you and delivers desired results.